The Cleveland Orchestra is the “aristocrat among American orchestras” (The Telegraph) and its conductor, Franz Welser-Möst, rules his subjects with a velvet glove. Indeed, velvet and silk keep showing up in descriptions of the Clevelanders’ sound under its principal conductor. 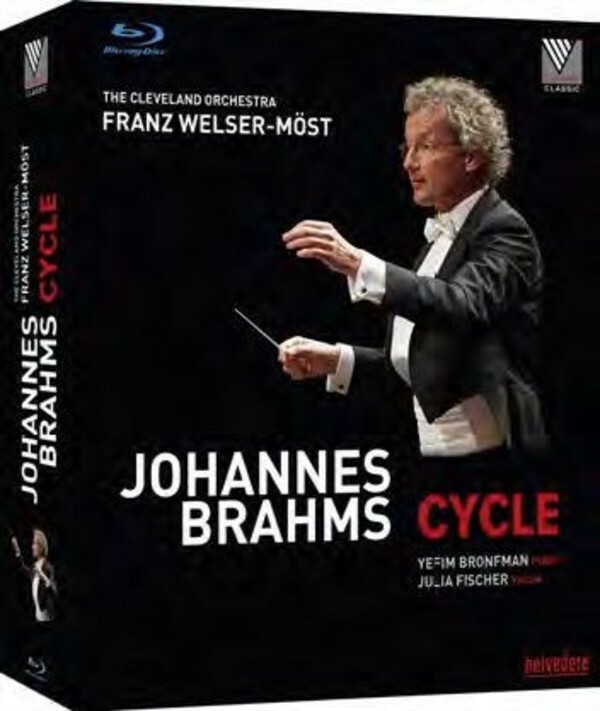 The First Symphony is Welser-Möst’s chance to let Brahms’ “mellow, silky sound” (The Guardian) unfurl about the stage of London’s Royal Albert Hall during one of the prestigious BBC Promenade Concerts. In the “frenetically applauded” (Die Presse) concert recorded at the splendid Golden Hall of Vienna’s Musikverein, Franz Welser-Möst leads his “devoted and exemplarily precise musicians” (Die Presse) in a rendition that polishes every detail to make the Brahms’ Second Symphony glow from within. In the evolution of Brahms’ symphonic oeuvre, his penultimate Third Symphony unites the brightness of the Second with the monumentality of the Fourth. Die Presse applauded the concert in which Franz Welser-Möst performed the Symphony as “structurally highlighted, vividly sketched details modelled with great subtlety”. Welser-Möst offers a “lean, propulsive performance” (The Plains Dealer) of the Fourth Symphony. The swift pace in his hands reflects the conductor’s quest for a distinctive, far-from-mainstream interpretation. Brahms’ rousing Academic Festival Overture and Violin Concerto op.77 bear witness to a composer at the height of his abilities, a mature master of large-scale masterpieces. The Violin Concerto demands extreme technical proficiency. As if to exemplify this, violinist Julia Fischer gears herself from the very start of this emotionally searing work to maintaining a restrained yet passionate tone. Yefim Bronfman has the uncanny ability to play large without stridency, to handle the most delicate passages without losing presence, and to play everything in between with a ravishing sense of tonal colour. In the Second Piano Concerto Welser-Möst and Bronfman brought pulsing energy to the concerto’s second movement, setting up an oasis of calm for the third that segued immediately into the genial finale, whose last chords were nearly obliterated by roars of approval from the audience. Laced into his forceful performance of Piano Concerto No.1 was a surprising element of fury, as if the pianist had become unhinged momentarily: and yet Bronfman was also wholly present, taking time in relaxed passages to savour every second.